A Federal Judge Says Russian Agent Maria Butina Will Be Sentenced April 26 She faces a maximum of five years in prison and could be deported to Russia after finishing her sentence, according to a plea deal she made with prosecutors. 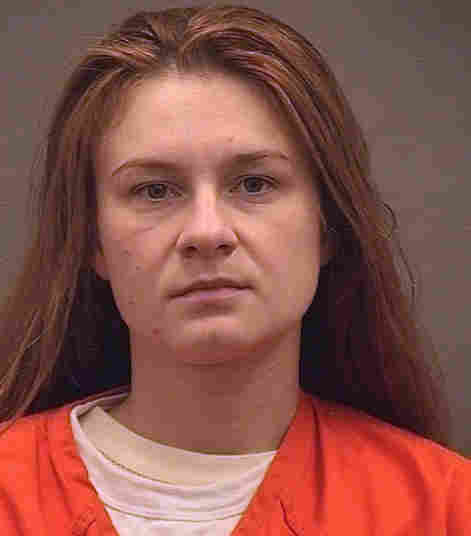 Maria Butina, the Russian woman who pleaded guilty last year to working as a clandestine agent in the United States, will be sentenced on April 26, U.S. District Judge Tanya Chutkan said Thursday. Butina, 30, sat silently in a green jump suit during the hearing. She faces a maximum of five years in prison but could receive zero to six months because of a plea deal. She was arrested in July and has been detained ever since, with federal prosecutors arguing that she was a flight risk. They accused Butina, a former graduate student at American University in Washington, D.C., of attempting to build ties between Russia and Republican politicians in the United States through the National Rifle Association and other groups. Her defense attorney, Robert Driscoll, told NPR last summer that Butina was misunderstood. "I think our minds fill in lots of things when you see a tall redhead with a Russian accent," he said. But in December, Butina pleaded guilty to a charge of conspiracy to act as a Russian agent without registering with the Justice Department. As part of her plea deal with prosecutors, Butina agreed to remain in federal custody with the possibility of being deported back to Russia after finishing her prison sentence. Under the guidelines, she could be handed a sentence ranging from zero to six months in prison, NPR's Carrie Johnson reports. Her lawyer said he hopes she will be released on the time she has already served. Russian state news agency Tass recently described Butina as being "optimistically minded." It reported that Russian diplomats had "congratulated" her for International Women's Day. The judge's announcement on Thursday follows charges filed last month by the Justice Department against Paul Erickson, a Republican fundraiser who was romantically involved with Butina. Prosecutors allege that he defrauded investors in a South Dakota business scheme. The indictment appeared to possibly reference Butina when it described how he made payments to "M.B." as well as American University. Erickson has pleaded not guilty.